The new national tourism brand of Azerbaijan "Take another look" was presented in London, the State Agency for Tourism told Sputnik Azerbaijan. The tourism exhibition "Excel London" began in the capital of Great Britain, London, on October 5. 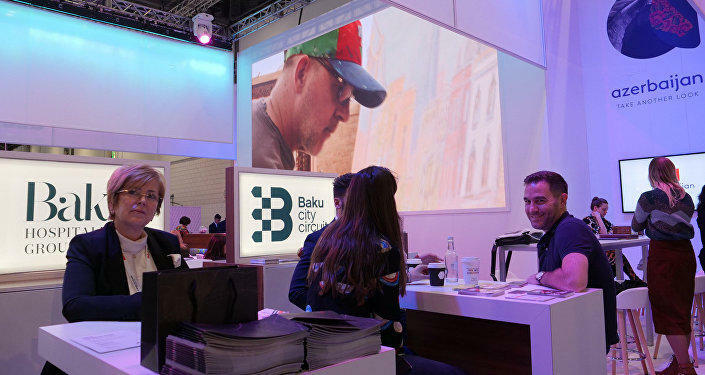 The brand was presented by the Azerbaijan Tourism Bureau within the World Tourism Exhibition (WTM) at the arena of Excel London. The presentation was attended by representatives of leading travel companies, various media outlets. Representatives of the Azerbaijan Tourism Bureau spoke during the presentation about the culture and history of the country, international competitions held in various cities of the country. Executive Director of the Tourism Bureau Florian Sengstschmid spoke about the importance of building new partnerships. He touched on the importance of working with global media and new travel companies. Director of the brand and marketing bureau Fidan Aliyeva, in turn, presented a new tourism brand of Azerbaijan and its logo. Aliyeva spoke about the culture and history of Azerbaijan and noted that the country has many opportunities. She said that culture, people, historical beauty of Azerbaijan always attract people. By creating a new brand, our goal was to reveal another beauty of the country. Deputy Chief Executive Officer of the Tourism Bureau, Bahruz Asgarov, told representatives of the media and travel companies about international competitions held in the tourist cities of Azerbaijan. He noted that a decision was made to open representative offices of the Azerbaijan Tourism Bureau in Germany, Russia, the United Arab Emirates, Saudi Arabia, India, China, Great Britain, South Korea and France in 2018-2019. World Tourism Fair will end on November 7. Tourism in Azerbaijan is developing rapidly, and to support the flow of foreign visitors, comprehensive activities are carried out. Azerbaijan is engaged in the efforts to diversify the non-oil economy, and tourism industry is one of the promising sectors to contribute to the achievement of this ambitious goal. The country ranked 71st among the most improved economies in 2017, having risen by 13 places in the global ranking. The State Statistics Committee of Azerbaijan earlier reported that in January-August 2018, 1,976,900 foreigners and stateless persons from 193 countries arrived in Azerbaijan, which is 8.5 percent more compared to the corresponding period of 2017. In January-August, the number of arrivals from the Gulf countries increased (with the exception of the UAE and Iran). Compared to the same period of 2017, the number of visitors from these countries increased 2.2 times, including citizens of Saudi Arabia and Bahrain - 2.4 times, citizens of Qatar - 1.9 times, Iraqis - 19 percent and citizens of Oman - 9.5 percent. The number of arrivals in Azerbaijan from the UAE decreased by 5.6 percent and from Iran by 25.4 percent. The total number of arrivals from the Gulf countries increased by 0.5 percent, which amounted to 433,600 people. In general, every fifth person who arrived in Azerbaijan was from the Gulf countries.